Over four weekends in March and April, members of Darebin Climate Action Now (DCAN) and Yarra Climate Action Now (YCAN) conducted doorknocking and street stalls in the Batman electorate. Volunteers spoke to over 500 people from Reservoir, Preston, Northcote, Fairfield, Alphington and Clifton Hill about their views on the development and funding of large scale solar power in Australia. The surveys are part of a campaign by 100% Renewables to have 10,000 conversations about Big Solar in 50 electorates around Australia. The results of polling of 417 people in Batman show overwhelming support for the building of large scale solar power plants in Australia from both the relatively high and low income parts of the electorate. This polling shows that Martin Ferguson is out of touch with voters in his own electorate. While Mr Ferguson is talking up the development of coal and gas, and talking down renewable energy (to the point of lying about its ability to provide baseload power and lying about its price, twice), his constituents want to see Australia transition to renewable energy. The results (see below) have been sent to Martin Ferguson, and we await his response. The table below outlines the results from our polling. In summary, 87% of people support the building of large-scale solar in Australia, and 91% support government funding for this sort of project. these solar plants in Australia? kind of government funding for big solar? did not complete the survey. Below is an unedited list of the hundreds of messages that were sent to Martin Ferguson by the people we surveyed. 1. Have an open mind to solar. You need to broaden your horizons and look to the future. Coal is going to get phased out. There needs to be a plan already. We should be exploring more solar power. 2. It sounds like a better idea to build solar. 3. Solar power is a great source of energy, and we should utilise this great gift, which can last forever. 4. We need to consider that [solar power] and stay away from nuclear. 5. Think of our kids- cos we’ve seen what nuclear power does in Japan and Russia and the coal only pollutes the air. 6. I think solar is good because it saves money. 7. Solar demands inclusion as an option to supplement existing coal power. I’m all for wind turbines and bio-energy. 8. Need to put efforts into sustainable energy sources. 10. Get with it. Surprised [you are] not already building big solar. 11. Should explore it. Would create jobs. 13. Get with the program. It’s the future, and better than digging up and burning coal. 14. Get rid of carbon tax – harness natural resources. 1. We should have more rebates for solar for sure. We should invest in large scale solar instead of coal. 2. We have a huge area in central Australia. You’re not going to run out of sun and wind. 3. You should start with Ministry of Housing houses for solar power – to help the strugglers. 4. I’m an electrician – we should build more like the one in Echuca. It’s free energy. You’ll make your money back. 5. Put solar panels on Ministry houses. 6. More should be being done. Fossil fuels are old technology and harmful to the environment. 7. Energy should be more natural, solar is more natural than using coal or nuclear power. 8. Renewable energy is the way of the future if we want sustainable environment. 9. Renewable energy will be good for the environment, but we want our money to be used wisely. 10. 1If we had more efficient solar panels or solar energy it would be better for the environment, and the economy, but it needs to be affordable to the general population. 11. Reliance on unsustainable big business is bad news! 12. It’s unsafe not to go something free of emissions. I vote in your electorate and I want big solar, not fossil fuels power. 13. Yes …I’ve written to [Martin] before. I think [big solar] is exactly the kind of thing we should be looking for. Commitment to unsustainable energy sources is disappointing. Australia is one of the last countries in the world to do this. We should be reading the world. 14. Burning fossil fuel is clearly environmentally dangerous to all living things (bad cycle). We should have been looking at clean sources to fuel our energy needs from the beginning. Please fund this for everyone’s sake. 15. Use the people’s money wisely. 16. Solar should be supported as long as the project location is suitable. 17. Should be giving reduction or rebate for local solar rooftops and not as much money into coal fired. 18. Solar is the best renewable! 19. [Put] funds into research for clean energy. 20. Please listen to your constituents, we want clean energy. 21. Please support clean energy for the people of Australia. 22. Renewable energy is the way to go. 23. The government should spend money on lots of things not just solar. 24. Please read the facts. You need better advisers, Martin. 25. Solar is an investment into the future. The old methods of supplying power are out-dated. 26. I’d like to see you support greener energy sources. It has to happen eventually. 27. We want our children to have a future in an industry that is sustainable. BZE have proved both economically and environmentally sound. Job creation wise, there is no ethical reason why we should be using coal at all. Renewable energy is the future for working class Australia. 28. Renewable energy reliance needs to be increased as part of a broader strategy, reducing out overall reliance on coal. 29. I do not support anything that is robbing our country of our resources. Start helping the low income people with affordable energy. 30. I don’t support anyone who is opposing solar and wind projects, which is good for nature and doesn’t emit carbon. We [should] promote wind and solar. 31. Better to support big solar rather than [coal] as solar is better for the environment. 32. [You] should be doing more to support investment in solar. 33. We should fund sustainable power. 35. Create a stable power environment to provide right environment for investment. 36. The clean energy board should have representation across the board. 37. Build big solar, we need it. It’s clean. 38. It will save a lot of money in the future. 39. Everything relies on us getting it right. We have to move away from fossil fuels. We’ve got so much renewable energy, let’s use it! 40. It’s time to give more money to Big Solar! 41. In the long run, it will be more economical to build big solar. 42. Solar is the future. 43. Solar power should be for the future (it’s not relevant in my [elderly] age group). 44. I am a fan of nuclear power, but it has to be run properly. 45. We have to look after the atmosphere, because I have twin boys. 46. [You] should not be blocking solar power. Solar should be widely used. 47. Well planned alternative energy is a must for our future. 48. I support solar energy for the future. 49. We need renewable and sustainable energy sources for our kids, and do it now. Build the infrastructure before mass need. 51. Be open minded about other energy sources. 52. You are wasting money on new coal fired power plants. 53. Think more long term than more short term; that wins votes. 54. About time we went solar. 55. It’s imperative that we invent and support new technologies to take us into the 23rd century, and not look backwards at the things we’ve always done. Now is the time. 56. I don’t understand why Australia doesn’t even do it. 57. Why aren’t they putting the finance into the solar industry? 58. We need to start moving away from coal to renewable energy sources. 60. Pull your finger out and do something about it. 61. Let’s now waste time on gas, go Blues! 62. Solar power needs to improve efficiency. 63. Build more solar power plants Martin. 64. We want more investment in renewables. 65. Solar and wind power are cleaner, can run for a longer time and no radiation. 66. I am in support of renewable energy. 67. Who pays your way? Coal and mining industry, or the people of Australia? You’re a traitor to Labor, and the people of Australia. 68. There are other alternatives to coal. 69. Cost of living is increasing day by day, so please do something in regards to solar energy. Solar energy is a renewable resource; this will help in reducing the bills of people. Help HH to play his bills. 70. Australia is full of sunshine, so why hasn’t the government capitalised on this? Why drag your feet behind other countries? 71. Please do the best thing for the future of Australia and the children of the planet. Solar energy please! 72. Hey Martin, get real. Start acting for our fossil free future, you fossil! 73. We support renewable energy. 74. We want more attention to be paid to the things that will keep the environment safe for future generations. 75. Look after the people and the country – the best nation in the world! 76. [You] should reconsider [your] stance. Nuclear power is not environmentally viable. 77. Bring on solar power! 78. Renewables are the future. You’re a dinosaur, Martin! 79. Renewables is a good step to take. 80. Invest in renewables instead of expanding coal. 81. I’m all for renewables. 82. Support and expand renewables. 84. I think wind and solar power are the future. Eventually we don’t have gas – even nuclear is not for ever and you leave a mess. 85. If USA is making them, then we should too. It’s going to be cheaper. Wind and solar – it’s always free. 86. Nuclear is cheap but very dangerous (I come from Europe and I know) Solar is good – never ending – good for the environment. 87. We sell coal to China and India – that’s politics. We like solar power, but we need government support for solar panels. We have lots of wind and solar. It’s good long term but difficult now – we need to sell resources to pay for it. 88. I’m not for nuclear power. 89. I can’t see why [Big Solar] can’t work. It makes sense! 90. Should build more solar power plants. 91. They do this and it just rips us off. They can do it but not out of our pockets. 92. We should be building solar power plants in Australia. 93. Alternative energy sources need to be considered. 94. I’m not into funding or supporting coal. 95. I support a balanced approach. 96. Don’t put it in heritage or Aboriginal land. We should be building these in Australia! 97. I support big solar. 98. Should give serious thought to big solar, it means clean energy for future generations. 99. Get off your asses and get on with it! 100. Put money in research and development for any technology that’s clean and safe. 101. I’m a big supporter of renewable energy. I think the government’s lack of investment in renewables is really short sighted. 102. Why [are you] supporting coal over renewables? 1. We can move to more renewables and we should. 2. Go away with your old ideas and get on to renewable stuff. 4. Should get onto what’s happening in other countries and bring it here. 5. Please do include more renewable energy when you discuss renewable energy and planned policy. 6. Solar power is much better – see it Portugal. Portugal has a huge one like this. 7. Listen to your constituents. – It’s your job! 8. It’s so short-sighted – your support of the fossil fuel industries – it’s mad. Other countries are leading. 9. The way – we have so much solar [energy]. We should lead the way, boldly. 10. You should retire! Get with the modern technology. Get out of the pocket of industry! 11. Solar – it’s affordable & it’s clean, and our climate is perfectly suited to it. Let’s do it! 12. Wake up comrade! From your local shop steward. 14. You need to think about our future. We have so much sun and wind available. 15. Grow up! Remember your constituents. You don’t represent us! 16. Large scale solar is easier than nuclear – you should do your homework – could be OK later but not till waste problem and safety are solved. 2. Please support big solar. 3. You need to listen to what people are saying and not listening to business interests. You need to support sustainable industries, not those that are polluting. 4. Why support nuclear after Fukushima when we could use solar which is sustainable. 5. Look after the people who support you. 6. Solar is good. Uranium is bad. Coal is bad. In Victoria we burn dirt for electricity. 7. I’m 12 and I want climate change stopped. 8. There’s no excuse not to fund big solar. If you don’t you’re threatening the future of all things on this planet. It’s proven. Just do it. Feed-in tariffs now! 9. I’m 17 and I care about the environment. 10. Nuclear Free please (x 2). Big Solar sounds great. 12. Why aren’t you moving towards 100% renewable energy? 13. Bloody Martin – Sexist – Met him at Preston Primary School. He shouldn’t feel safe there. It’s quite progressive. 14. Mother and daughter – Labor says Roxburgh Park is turning green! 16. Very short sighted. Should be in the forefront. 17. Knows about 100% renewable from AYCC. 18. Why are you blocking big solar? 19. Politicians should listen to those who have the knowledge about the environment rather than people who have the money. 20. We’ve been subsidising brown coal for decades. It’s time we put our money into clean energy like big solar! 21. Having worked all over the world, I believe that it would behove you and be in your best interest to use renewable energy instead of the coal burning and gas energy. Think about it! We need real action on climate change, not more subsidies for the coal and gas industries. 22. Get on with it now! 23. Govt. needs to do more to protect the environment and provide clean energy for the future and [our] grandchildren. 24. Get rid of support for nuclear and coal and association with big business. Get on with clean energy which makes jobs. 25. Get on with Big Solar. 26. We need to change to clean energy now! 27. Solar energy should be given resources and research funding equivalent to other electricity production. 28. Think of the future and the environment and get on with it! 29. Should be looking at ALL renewables – Coal is [a] finite and filthy resource. 30. Use solar as well. Government needs to build something impressive like the Snowy Mountain scheme. 31. Emphasis on fossil fuels all about business. All short-termism. Need to think more long term. 32. We don’t want nuclear. We don’t want coal. Time to catch up! 33. He’s an idiot. Not very smart. Not in touch with his electorate. 34. Pull your head out of your arse. Do your research. 35. Not coal, gas or nuclear. Support renewables! 36. Stop supporting dirty industries. 37. I can’t stand you! 38. Build big solar now. 39. 100% in support of solar power. 40. Take the opportunity while you have this portfolio to get solar energy off the ground. 41. Use it for clean energy – solar power is free and clean and we have so much land for this! 42. We need to invest in renewable industries. The $10b should be used in that fashion rather than supporting the old industries. 43. Look at it! Consider it! 44. Consider molybidenum [thorium?] nuclear reactors. 45. Contribute to true renewable energy sources. People think this money is going to real renewable energy. 46. Important to support solar and understand the views of new constituents. 47. It is clean, green and after set up solar is free. Nuclear is not an option. 48. Should go to another country and live there. 49. Need to look at more than one form of power. Must consider all options. 50. Please move us to clean energy future. 52. Would like to see progress on geothermal. 53. You’re wasting your time in Victoria with that cretin in Spring St.
54. Firm believer in renewables. 55. Also would like to see progress on geothermal. 56. Support carbon tax totally. 57. We need to get beyond globes and shower heads. Power companies very hard to deal with on roof top PV installations. 58. Stop digging up the country and shipping it overseas! 59. Keep an open mind and invest in the future! 60. Nowadays we need a green environment. We need to change and invest in this technology. 61. Oil and gas will deplete someday. We should harness solar energy and use what God’s given us. 62. Seems crazy that we’re putting money into coal and gas. 63. Need to invest more in renewable energy. Coal is going to run out one day. 64. It’s crazy that we’re not investing more in solar. We’ve gt so much of it. 65. A bit ridiculous to keep funding the same old energy sources. 66. Don’t invest any CEFC money in gas. It is not clean and is not renewable. 67. The future is renewables, the past is fossil fuels. 68. If you don’t support renewables, maybe you shouldn’t be Minister for Energy! Get your head out of the sand. 69. Yes: we should be supporting renewables! 70. Invest more in renewables, including big solar. 71. I support renewables, I’d like you to represent that. 72. Don’t be so close-minded. 74. Wake up! its not about you Martin. Its about the climate and our children. 75. Martin, open your eyes and stop listening to big coal. 76. Don’t invest any CEFC money in gas. It is not clean and is not renewable. 79. Get on with rolling out renewables. 80. Renewables are a real investment in our future. 81. I support CEFC funding as long as it goes to renewables. 82. Push for renewables. Move away from gas and coal. 83. I support responsible use of the $10b on renewables. 84. We really need to start building solar power in Australia. 85. I fully support funding for renewables. 87. Think more about the future. Cheaper coal at the moment won’t stay cheap. 88. I don’t support nuclear power. He should do more on solar power. 89. Dear Mr Ferguson, I am shocked by your climate destroying attitude and will work hard to unseat you at the next [election]. Cheer! 90. Everything should be given a go. 91. In general I’d be supportive of renewable energy as opposed to coal and nuclear. 92. Build big solar for jobs in Australia. 93. Get real and deliver the rhetoric. Stop supporting big business. 94. Take appropriate measures to look after the environment. 96. Clean energy should be a priority. 97. I support renewable energy. 98. Do something more with renewables. 99. Listen to your constituents. 102. Australia is an ideal place for solar. 103. We need to use out natural renewable resources. 104. What is your choice between long-term sustainability or short term lobbying from the coal industry? 105. I’m fully supportive of renewable energy sources like solar and want my taxes to support that. 106. Energy sustainability is paramount to a liveable planet and ensuring our children’s future. Australia is the perfect environment to pioneer in this field. 107. I’d like the ALP to get behind investing in renewables once you do it the population will realise how good it is or we will get Abbott in and that will be hell! 108. We have huge opportunities for renewables in Australia so why aren’t we using it? 109. I support renewable energy for the country. 111. Decentralised solar power in domestic homes is the most effective and efficient way to generate domestic electricity. 113. An obvious source of energy in solar-rich Australia. 114. Time to do what is ‘Right’ and lead. 115. If they can do it in Spain, why not here? 116. We need to be looking at alternatives because coal [is] not the answer. 118. Martin, stop living in yesterday’s world. Start planning and thinking for now and the future. 119. Extraordinarily important. Happening in Spain, why not here? We have more sun than Spain. 121. Please consider this ground-breaking technology. Why is Spain utilizing this and Australia doesn’t know about it? Solar not coal is the future! 123. Don’t be a Wally. Just get behind it! 124. Absolutely! In our climate – it’s crazy we are not making use of solar for all our power requirements. 125. Sooner rather than later coal will kill our planet. Are we insane? 126. Retire! Support Big Solar. Stop supporting coal. Stop destroying our efforts to cut emissions. 127. FUND BIG SOLAR TODAY!!! 128. Please represent us!!! Big Solar is a great resource – use it and I urge you to do your job as Resources Minister. – Darebin resident. 129. Time to get moving and aim for 50% renewable energy ASAP. Coal is old technology and dangerous to health. 130. Time to build solar now. Time is running out. Forget pretending carbon sequestration will work. YCAN will be knocking on doors, surveying Clifton Hill residents on their attitudes to renewable energy on Saturday 28 May for 2 hours. This event is part of the national 100% renewable energy campaign, which is aiming to collect 20,000 surveys across Australia to be tabled in Parliament by Independent Rob Oakeshott in June. We need lots of people to help reach our target of 500 surveys. Training and materials will be provided. Sign up online or contact us for further information. The Athol Gill Centre in Clifton Hill (100 Hodgkinson St) is hosting a fantastic weekend of community events on global warming, 22-24 October. Come and hear state electoral candidates engage with issues concerning climate change and the environment. The evening will include Q+A and focus groups which will contribute to a report to be submitted to local council and all political parties. This is a chance to have your input and for your voice to be heard. An expo of business and communities groups who are each working towards creating a green earth. Come and learn more from people in the know, evening hosted by Rod Quantock. 10am, 24 October, Come and hear Deborah Storie address the impact of climate change on the world’s most vulnerable. Deborah Storie is Deputy Chair of the TEAR Board, and a member of the Program Review Committee, which makes decisions about funding allocations to established TEAR partners. A former TEAR fieldworker in Afghanistan, Deb travels regularly to TEAR projects in a monitoring and advisory capacity. To wrap-up the weekend festival there will be a community lunch which will feature foods and picnic equipment that are kinder on our environment. Come along for some great food and pick up some tips and recipes for your next picnic. 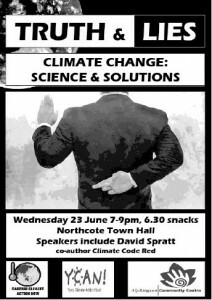 Come and hear about climate change science and solutions at Truth & Lies, a presentation by Climate Code Red co-author David Spratt at Northcote Town Hall (189 High St, Northcote) on Wednesday 23 June from 7.00–9.00pm (snacks from 6.30pm). Brought to you by Darebin Climate Action Network, Yarra Climate Action Now and Alphington Community Centre. 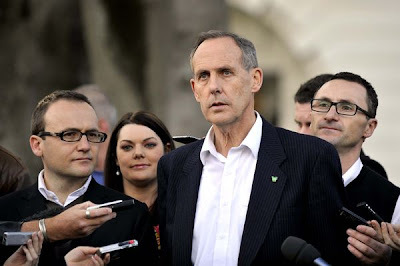 Richard Wynne, our beleaguered State Labor Government Member of Parliament, feeling his political mortality and searching for some environmental credibility in the absence of any useful environment policies invited his constituents to a ‘City West Water’ shower head exchange on a suburban street corner in Clifton Hill. A number of YCAN friends and supporters showed up in response to this invitation to remind him of the climate and environment issues the ALP wants Australians to forget. This was YCANs first action as part of the combined ‘Replace Hazelwood’ campaign. Wynne and his staffers were extremely unhappy to see us and enthusiastic responses from passing drivers to the ‘Honk for Urgent Climate Action’ sign visibly irritated the shower head exchange team making it all the more worthwhile for those of us on the other side of the street. Thanks to all who participated and especial thanks to Mic Rosenbrock for the terrific video. There are a few events coming up this month that you can’t miss!! What dinosaur has eight chimneys, eats coal and suffers from terrible gas? With live music, stand-up comedy, great questions, food and drink. 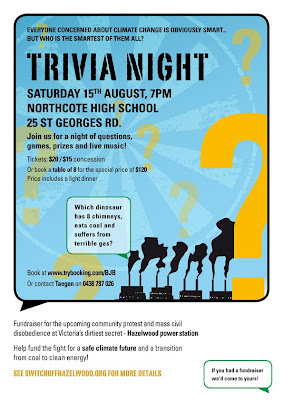 This is a fun night for all to raise money for the upcoming Hazelwood Power Station protest. Details: Saturday August 15, 7pm-10pm – Northcote High School, 25 St Georges Road, Northcote. Tickets also available on the night unless sold out. Come and hear the world-record holder for the fastest climb of Mt Everest talk about the effects of climate change in the ‘roof of the world’. Hear Pemba Dorje Sherpa, holder of the world record for the fastest climb of Mount Everest, talk about his experience of global warming in the Himalayas. He is joined by environmental lawyer and activist Prakash Sharma, Pro Public Nepal. Global warming is already having a big impact on Mount Everest and the Himalayas. Glaciers are melting creating floods and danger for the local people. But the big melt also means a big dry as these ‘water towers’ of Asia lose their capacity to provide water to the giant rivers in the summer months. Eventually rivers like the Ganges in India and the Yellow River in China will lose their dry season flow and the billion people in these river basins will lose their water security. We are a group of Clifton Hill residents – not experts – with the shared aim of helping each other to live more sustainably and encouraging action that avoids runaway climate change. Perhaps you share our concern but find the issues frighteningly large and complex and are unsure of what you can do that will make a difference. would it help and what will it cost? If you are interested in any of the above issues, this meeting is for you. There will be displays with handouts and people with particular expertise to talk to. Featuring Rod Quantock, Yarra Climate Action Now, Beyond Zero Emissions, The Environment Shop, the Ethical Consumption Group and other local groups.